Through the darkness and the storm hold on to hope. What gives you the endurance to stand firm through hardship? How can you outlast every storm that comes against you? What gives you strength to press on, even when you feel you can't take another step? Hope. The Bible calls hope an anchor for the soul. In his signature style, Bishop T.D. Jakes shares wisdom and inspiration from Scripture to help you thrive in every season. Experience rivers of refreshing-whether you are in the valley of trial or on the mountaintop of victory-by clinging to Hope for Every Moment! 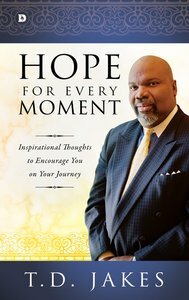 About "Hope For Every Moment: Inspirational Thoughts to Encourage You on Your Journey"